Beneath the sparkling Jeju surf and the hulls of fishing boats carving through the waves is a creature of culinary legend – the abalone. This shellfish, found feeding on seaweed in only the cleanest waters of the ocean, forms a vital part of Jeju cuisine and holds an elevated position as the “Emperor of Shellfish” not only in Korea, but the world over. During the Joseon Dynasty, abalone was presented to the Emperor as a gourmet gift, often alongside tangerines which were also considered the food of royalty. Long held as the “ginseng” of the sea, the abalone was felt to contain almost other-worldly powers of restoration and fortification for the body. Legend tells that the Chinese Emperor Gin Shi Hwang traveled to Jeju in search of eternal youth and upon discovering Jeju abalone, declared it the elixir of life. Luckily for us, abalone in Korea is no longer the reserve of kings but is available to everyone, and there can be no better place to try it for the first time than here in Jeju. However abalone is prepared, once tasted its remarkable flavor, delicate and creamy, with a firm texture and a clean aftertaste, is not quickly forgotten. When stir-fried in its shell, it develops a slightly smoky flavor. 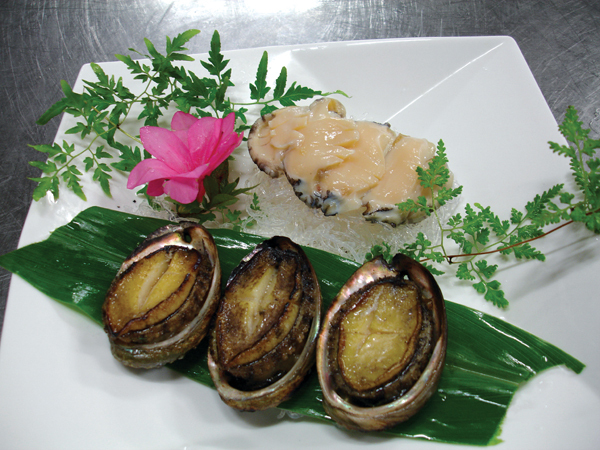 Abalone dishes are not about the strong marinades and spices that many of us associate with Korean cuisine. They are all about delicacy and appreciation of the finer flavors offered by Jeju’s seafood. For those seeking optimum nutrition abalone can be eaten raw, thinly-sliced, offering a texture with more bite and an equally creamy taste as its cooked counterpart. A natural tonic, abalone offers a wealth of vitamins and proteins that are easily absorbed by the body and is an ideal food for women in the weeks after childbirth, or those recovering from illness, as it helps to restore strength, cleanse the liver, and aids blood circulation and digestion. Although it is no longer a gift for royalty, abalone remains the most expensive shellfish you can buy due to its living environment; it feeds purely on seaweed and will only live in clean waters. This enhances its reputation as a pure and natural food. These days 95 percent of abalone served is grown on fish farms, as to use only naturally-harvested abalone would make dishes prohibitively expensive. A single pound of abalone harvested by the Haenyeo women-divers of Jeju can fetch a price of around 100,000 won, which would make a meal of these shellfish a very expensive dinner. The vast majority of abalone restaurants on Jeju use farm-raised abalone for this very reason and this may detract only marginally from the nutritional properties of the dishes they serve. At O-Ou-Neul abalone restaurant, on the outskirts of Shin Jeju, fresh deliveries of live abalone are received daily and as many as seven chefs are on-site at any one time due to the nature of abalone cooking. An emphasis on freshness means that no dish can be prepared in advance. The process of cooking abalone is as delicate as the taste of the fish itself. Chefs skillfully control the temperature and length of the heat exposure when preparing it to ensure that the desired texture is produced. If it is overcooked it can become tough and lose much of its gentle flavor. While abalone in Jeju is expensive compared to other dishes, it undoubtedly earns its price when remembering all that goes in to harvesting, preparing and serving it. A meal for two at O-Ou-Neul abalone restaurant can cost in the region of 30,000-50,000 won depending on the dishes chosen. This price also includes many delicious side dishes to complement the exquisite taste of the abalone, and a cup of invigoratingly spicy cinnamon tea to finish. O-Ou-Neul abalone restaurant is located on the Yeonbukno road, about four blocks east of the KCTV building.